Kanai Lal Mukherjee passed away on December 20th, 2018 at age 89 in Nashville, TN. Dr. Mukherjee was known by many names (Dadu, Thaku, Babujee, Meshomasai, Cyber Grandpa, Kanuda, Mastersaheb, Doiakaku, Room 222). He inspired countless others with his positive attitude, resilience, and contagious joy. He was still joking hours before his death. Dr. Kanai Mukherjee was born in Benares, India. He grew up on the banks of the Ganges River, the eighth of eleven children. In his childhood he learned Hindu rituals by helping his blind father. He eventually went on to college, where he received a B.Sc. in Agriculture and a PhD in plant physiology. He married Bibha, a highly-educated trailblazing female professor. In 1960 Dr. Muhkerjee accompanied his wife to the United States when she enrolled in a PhD program in Iowa. He returned to India for several years, then immigrated to the U.S. with his family in 1968. He held various faculty positions, eventually becoming a professor at Essex Community College, a Fulbright professor, and a respected priest in the Baltimore community. He authored several works on medical laboratory technology in developing nations. 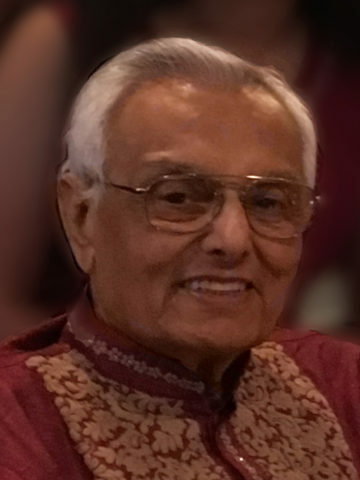 Later in life he started a nonprofit organization, Association of Grandparents of Indian Immigrants (www.agiivideo.com), devoted to spreading knowledge of Hinduism, Indian history and culture. His last project was a compilation of all major Bengali Hindu rituals with translations, audio recordings, and detailed explanations. His works have touched the lives of countless people across the globe. He is preceded in death by his wife of 53 years, Bibha Mukherjee. He is survived by his pride and joy: his three children, six grandchildren and one great-grandchild. Bahu din dhare nam suntam,khub kharap lagche. Our heart-felt condolences to Tinku and to all her brothers and sisters. Mesomosai had such a positive influence on so many of us here in PA. May his soul rest in peace. Tinku, our heart felt condolences to you and your family. Mesomasai was so close to all of us at Lehigh Valley and inspired us by his positive outlook. May his soul rest in peace. “Positive attitude, resilience, and contagious joy,” describes very well the gentleman that I remember as Dr. Mukherjee (one of many doctors in the family). He was a natural extrovert, jolly man, who very neatly fit into the role and outfit of Santa Clais for us children one year. Our family got to know the Mukherjees while in Iowa, and they have remained firmly in our memories. Kanai will always be a blessing to remember. I wish my former playmates and their children much peace as they grieve the loss of a special, beautiful man. We are truly sorry for the loss of Dr. Mukherjee. The Creator of heaven and earth has made a promise in his holy writings that , “there is going to be a resurrection of both the righteous and the unrighteous.” (Acts 24:15 in the Bible) Yes, our loved ones who have died have the hope of being recreated. May this promise bring you comfort and hope.